Israel’s attempt to become the first country to land a private spacecraft on the moon has ended in failure. 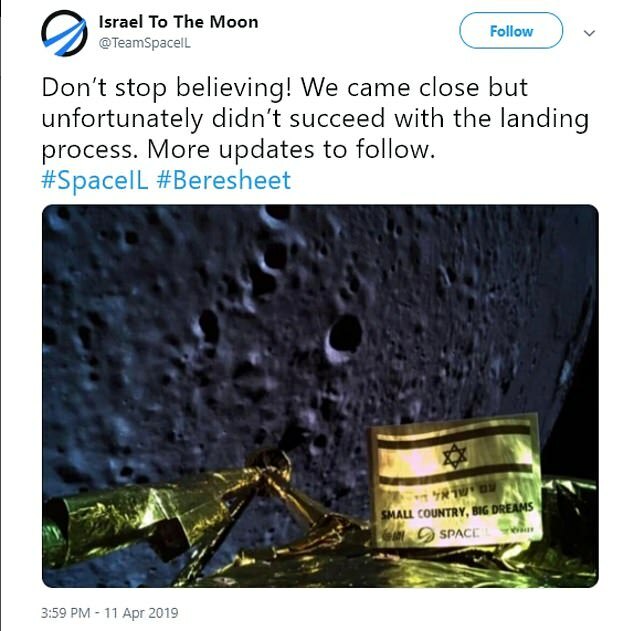 The Beresheet spacecraft began experiencing problems shortly after beginning its descent, despite a promising start in which it sent back a selfie at just 22 kilometers (13.6 miles) from the surface. Mission control confirmed just minutes later that it had lost contact with the lander after resetting the main engine in effort to address an issue and get it all working again. Engineers on site estimate the craft was about 15 kilometers (9 miles) from the surface when it began to break apart, being unable to slow down without its main engine. 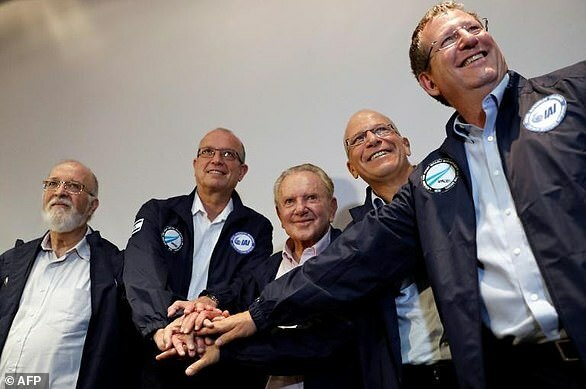 SpaceIL was hoping to complete a landing of Beresheet on the moon and make Israel the fourth country to manage the feat - behind the US, Russia and China. While it was unable to achieve this accomplishment, the mission still makes Israel only the seventh country to ever each lunar orbit. The lander - whose name is Hebrew for Genesis or beginning - took off almost two months ago from Cape Canaveral in Florida. SpaceIL says it's now planning to launch another lunar mission within the next three years. Beresheet will stay in Earth’s orbit for about a month, slowly widening its ellipse until it reaches apogee, or its farthest point from here, at nearly 250,000 miles (400,000 kilometres) away. It will then be slowly introduced to the orbit of the moon. 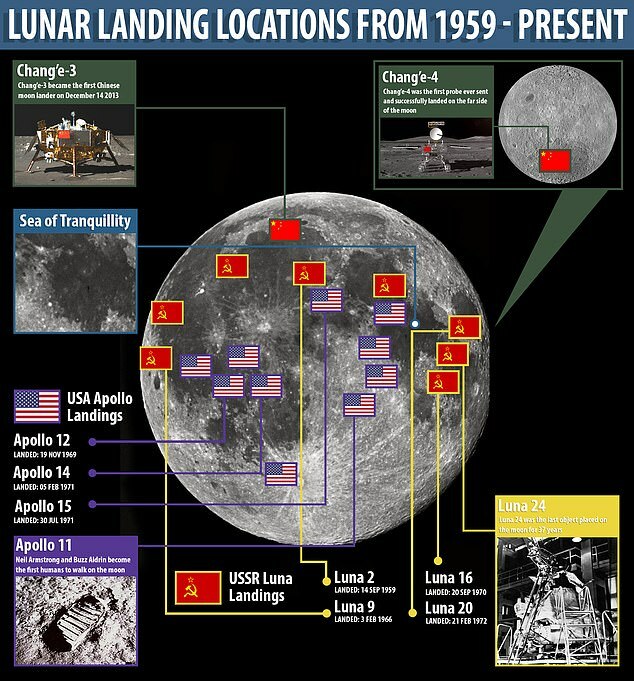 Lunar surface operations are meant to last just two days. Beresheet will measure the magnetic field at the landing site, and send back data and pictures. A time capsule is aboard the lander - which includes a picture of Israeli astronaut Ilan Ramon, who died aboard space shuttle Columbia in 2003. There's still uncertainty as to what exactly went wrong during the descent. 'Once the engine stopped working the velocity was too high, and the inevitable end was that it fell to the moon's surface - not as one piece,' Halbersberg told MailOnline at the SpaceIL headquarters. The engineer estimates Beresheet was intact until about 15 kilometers from the surface. 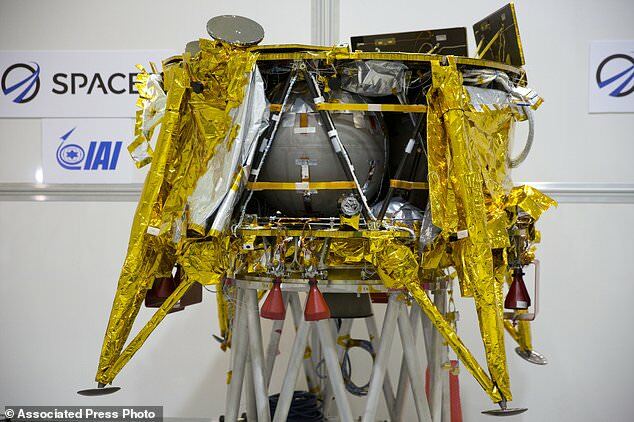 According to SpaceIL's Opher Doron, the engine was then turned off as the team worked to correct the problem. 'It was a very big achievement but the final stage was disappointing,' Halbersberg told MailOnline. 'Now we have a plan to send another satellite within three years,' the engineer added. SpaceIL's Beresheet was part of a 'ride share' with Elon Musk's SpaceX, as the mission could not afford its own rocket. After travelling over 3.4 million miles (95.5m km) around the Earth and drawing ever closer to the moon, the spacecraft finally swung into the moon's elliptical orbit on April 4 - keeping it on track for today's touchdown. The landmark attempt began shortly after 3pm ET (8pm BST) and in a live-streamed event held by Contact Global Broadcasting Services. The four-legged spacecraft, which is around the size of a washing machine, circled the Earth in increasingly large orbits ahead of its descent as it waited to be captured by the moon's gravity. 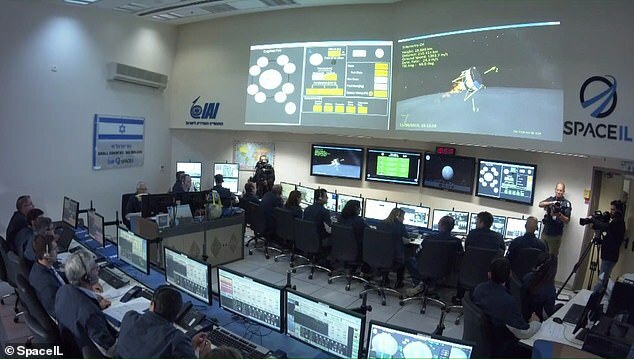 Achieving a soft landing on the moon is a notoriously difficult task – and one that unfortunately proved too much for Beresheet. Ahead of the landing attempt, Dr Mini Saaj, Head of the Robotics and Control Research Group at the University of Surrey, told MailOnline: 'Though space agencies from the US, Russia and China have previously demonstrated entry, descent and landing on the surface of the Moon, a soft touchdown that Beresheet will attempt is still technologically challenging. 'Unlike hard impact lunar probes, soft touchdown on a targeted landing site requires reliable and high precision guidance, navigation and control systems alongside other safety-critical subsystems, like the on-board propulsion mechanism for precise landing. 'Further, unlike mobile surface exploration rovers that are capable of examining larger regions, the reachability of static landers is limited to a few meters within the landing spot,' Saaj said. A time capsule is also on board the lander - which includes a picture of Israeli astronaut Ilan Ramon, who died on the space shuttle Columbia in 2003. It also contains as a lunar library consisting of 30 million pages on a disk from the US-based Arch Mission Foundation. Dr Saaj added: 'If the Beresheet mission succeeds, it will act as a catalyst to attract more private investors to fly interplanetary missions in the future. WHAT IS SPACEIL AND WHO IS THE BILLIONAIRE BEHIND IT? SpaceIL is an Israeli nonprofit organization that aims to make history by landing the first Israeli spacecraft on the moon. 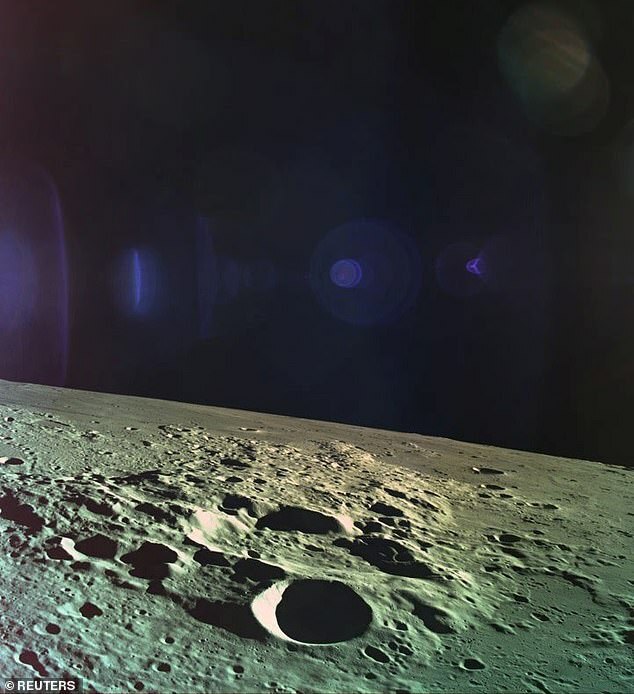 It is working alongside state-owned Israel Aerospace Industries to launch an unmanned module to the lunar surface in December. The project's largest donor South African-Israeli billionaire Morris Kahn, who made most of his riches through his telecomms software firm Amdocs. 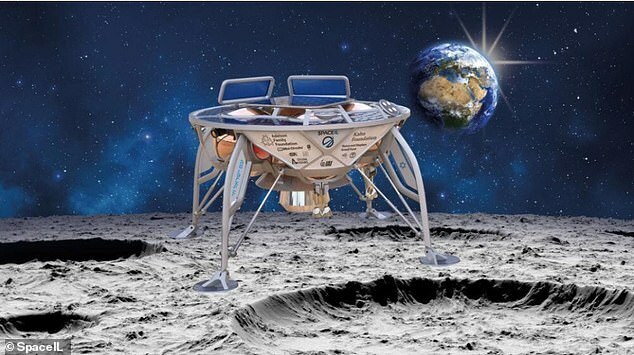 Founded in 2011, SpaceIL originally vied for Google’s Lunar Xprize, which challenged private companies to try to land an unmanned craft on the moon. But the $20 million (£15 million) competition was scrapped by the tech giant earlier this year when it became clear none of the five firms would meet a March deadline. On January 4, 2019, China became the third nation in history to land on the moon, and the first ever to touchdown on its 'dark side'. Lunar explorer Chang'e-4 touched down at 10.26am local time (2.26am GMT), state media reported, and took transmitted a 'close range' photograph in a global first. While stationed on the moon, Chang'e-4 has attempted to recce the famous Von Karman crater in the Aitken basin, the largest impact crater in the entire solar system at eight miles (13 km) deep and 1,600 miles (2,500 km) in diameter. The far side of the moon - colloquially known as the dark side - actually gets as much light as the near side but always faces away from Earth. This is because the moon is tidally locked to Earth, rotating at the same rate that it orbits our planet, so the far side - or the 'dark side' - is never visible from our planet. This relatively unexplored region is mountainous and rugged, making a successful landing much harder to achieve. 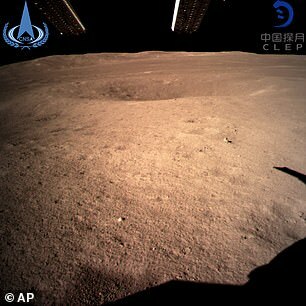 The moonscape appeared to take on a reddish hue in some of the images released by China, according to Christopher Conselice, a professor of astrophysics at the University of Nottingham who said it is an effect from the lights used on the mission.